SOUTH Korean Min A Yoon won the Ballina Junior Masters with a dominant victory in the girls division while Will Martell came from behind for a one-shot win over Harvey Remfrey. Yoon was on another level to her playing partners in the girls, firing her second straight three-under par 69 to run away with the title. The impressive 16-year-old backed up her top 10 finish at last week's Australian Girls Amateur Championship with nine birdies over the 36 holes to claim her first Ballina Junior Masters, defeating Annika Boyd (Pymble) by nine shots. A further seven shots back in third place was 12-13 years champion Haruhi Nakatani and Lower North Coast girl Pyper Hollis (Kew). There was local success in the 11 year and under division, with Stella Payne (Ballina) claiming the nett title. Whie Yoon was cruising in the girls division, there was a log jam in the boys with as many as 10 players in the hunt with nine holes to go. Martell handled the pressure best, picking up birdies on the 17th and first to finish his round on a high to pick up the one-shot victory. Remfrey birdied his last hole to claim second place, while also winning the 16-17 age division. Jye Halls (Mollymook), Yevin Samararatne (Queensland) and Ethan Chambers (The Australian) finished in a share of third two shots further back at one over par. Tyler Glavoich and Danny Mackenzie also picked up home trophies for the Ballina club, having success in the 16-17 and 11 years and under nett divisions. 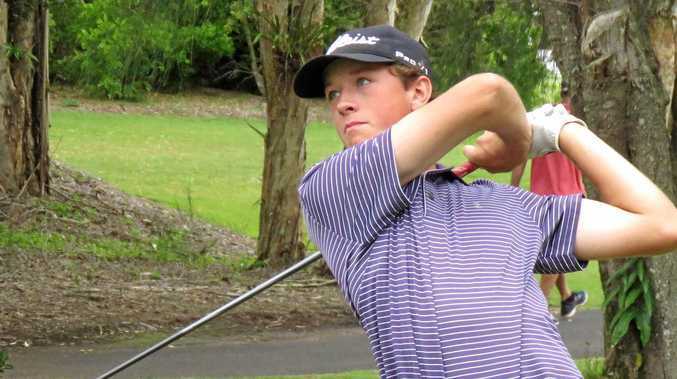 The shot of the tournament belonged to 14-year-old Brij Ingrey (Newcastle), who recorded his first ever hole in one with an ace on the 17th hole.